Dessert for breakfast? These naughty looking pancakes are figure friendly and guilt free while tasting amazing! A must-try pancake stack!! 1.) 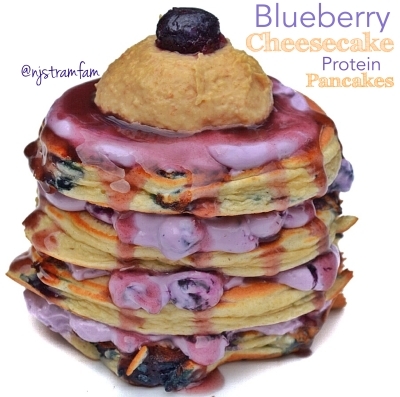 Place all protein pancake ingredients, except blueberries, in a medium sized bowl. Mix with either a hand held mixer on low speed until batter is smooth. 2.) To make the filling, add cream cheese to a small mixing bowl. Using a hand held mixer, blend cream cheese until completely smooth. Add in remaining filling ingredients and blend on medium speed until well incorporated. This should â€œmashâ€ the blueberries into the filling. 3.) For the graham cracker sauce, slowly add water to graham cracker crumbs, maple syrup, and pudding mix while whisking until desired consistency is reached. 3.) Cook pancakes on non-stick skillet over medium heat about 2-4 minutes on each side. When pancakes are cooled, evenly distribute filling in between each pancake & top with graham cracker sauce.